Any way you look at it, 2018 was a great year—maybe even the best one yet—for the Offshore Powerboat Association. Not only did the New Jersey-headquartered outfit produce six successful races from Central Missouri to Southwest Florida, as well as events in Maryland, Michigan and New Jersey, it began collaborating with Powerboat P1 on a six-race American Power Boat Association Championship series for 2019. The series will kick off May 17-18 in Cocoa Beach, Fla., before moving to other venues in Florida, Indiana and Michigan—and finally back to Florida. Allyson Papp was honored with the 2018 Jimmy Welsh Award and shared the stage with OPA stalwart Augie Pensa. Photo by Tim Sharkey/Sharkey Images. Given all the Extreme, Super Cat, Stock and Super Vee Lite teams reportedly committed to the series, that’s a giant step for OPA—and one that is sure to bring significant changes to the organization. But one thing will never change: OPA is a family, some members associated by blood and others simply by extension—all bonded by their shared passion for offshore racing. And so the OPA family members celebrated their 2018 season last Saturday night at Martell’s Lobster House and Tiki Bar in Point Pleasant Beach, N.J. 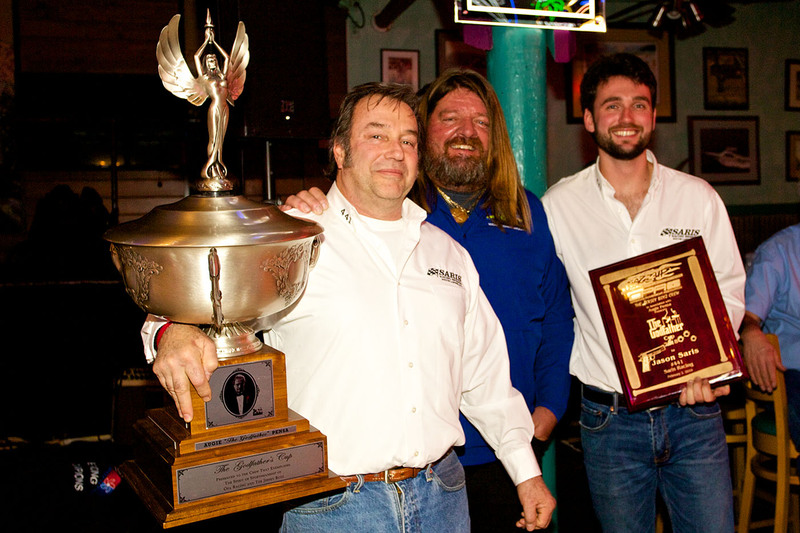 They honored their 2018 National Champion teams: Bat Boat in Class 2, Wazzup Racing in Class 3, American Outlaw in Class 4, Specialized Racing in Class 5, Smith Brothers Racing/CRC in Class 6, Dawson Custom Marine/The Punisher in Class 7, Done Deal in Super Vee Lite, Shadow Pirate in Super Stock, AMH Motorsports in Super Cat and Miss GEICO in Extreme. (From left) Godfather Cup winner Jason Saris was joined by Miss GEICO team partner Scott Begovich and his son, Johnny, his Saris Racing Engines teammate/driver. Photo by Tim Sharkey/Sharkey Images. 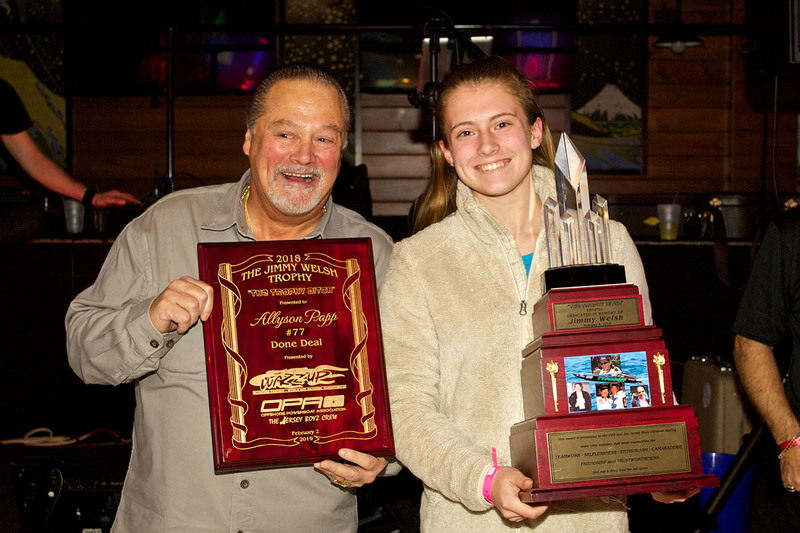 Celebrating the selfless qualities of the late Jimmy Welsh, a beloved non-racing member of the OPA community, the Jimmy Welsh Trophy went to 16-year-old Allyson Papp, one of the daughters of the Done Deal team’s Steven Papp. More than a cheerleader for the Done Deal outfit, Allyson Papp has become an ebullient representative for the entire SVL class. Shadow Pirate was among the 2018 OPA National Champion teams honored last Saturday night. Photo by Pete Boden/Shoot 2 Thrill Pix. But the high point of the celebration was delivered via video. John Haggin, the former owner of AMF Offshore Racing—the original backer of the Miss GEICO team who exited the sport in 2010—sent a video thank-you to OPA head Ed “Smitty” Smith for “uniting the sport” in light of the organization’s series partnership with Powerboat P1.